LIMA, Peru (CNS) — In the mountainous Diocese of Chulucanas, on the border with Ecuador, accompanying people in hard times can be dangerous. But Chicago-born Bishop Daniel Turley has been doing that for nearly five decades, since his arrival as an Augustinian priest shortly after his ordination. 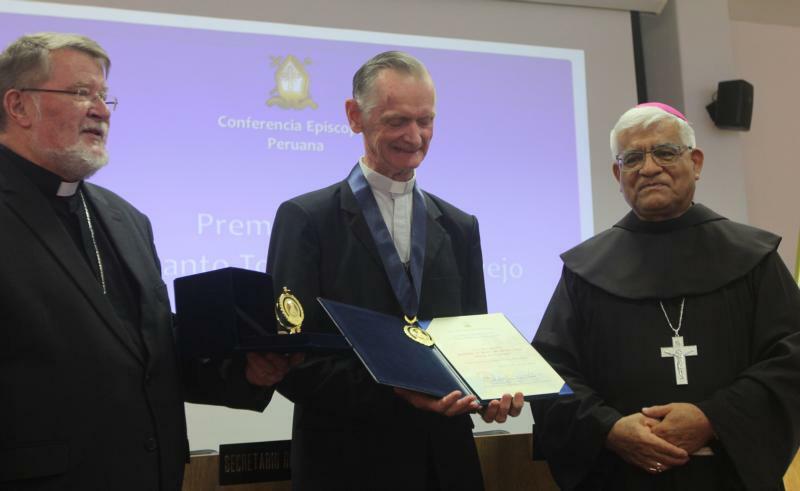 Bishop Turley received the St. Toribio de Mogrovejo Medal Jan. 17 from the Peruvian bishops’ conference. The award, named for the 16th-century Spanish missionary who was the second archbishop of Lima, celebrated the 50th anniversary of Bishop Turley’s ordination to the priesthood. Bishop Turley, who arrived in Peru shortly after his ordination in 1969, told Catholic News Service that the past five decades have been a time of constant learning. The first lesson came immediately upon arrival. Bishop Turley arrived in Peru as a young priest just after the Second Vatican Council and shortly before the Second Conference of Latin American Bishops in Medellin, Colombia, in 1968, where church leaders called for a preferential option for the poor. As a priest, Bishop Turley worked in Pacaipampa, a farming village accessible only on foot or by horse or mule. To avoid being targeted by either side, men would often sleep in the fields or in the hills at night, Bishop Turley said. “You’re walking with people who are very wonderful people, but they have a lot of suffering in their lives, too,” Bishop Turley said. Bishop Turley’s “generosity, and the patience he has to listen to anyone who seeks him out” have made him beloved by the people of the diocese, Bishop Robert Prevost of the coastal city of Chiclayo told CNS. Bishop Prevost, a Chicago native and former prior general of the Augustinians, worked in Chulucanas in the mid-1980s as a young priest, when then-Father Turley was the local Augustinian superior. Bishop Turley made the journey with pilgrims from his diocese who carried the Captive Christ, an 18th-century image of Jesus as a prisoner before his crucifixion, which draws thousands of pilgrims to the town of Ayabaca every October. Arriving in Trujillo the day before the open-air Mass celebrated by Pope Francis, instead of seeking comfortable lodging, Bishop Turley spent the night on the beach with the other pilgrims, Bishop Prevost said.